DFW is doing a series on 50 must-eats to find out those real hidden gems on the streets of Delhi. The third in the series is Madan Lal Halwai in Sadar Thana Road, Sadar Bazar. One of the oldest halwai shops in Old Delhi, the eatery was started in 1948 by Late Madan Lal. Currently run by Chaman Lal and his son Manish Sethi, the family migrated to Delhi after partition and started the halwai shop in Sadar Bazar. Chaman lal ji has a pleasant personality and he fed me generously, the day I visited the place. As you enter the shop, on the left hand side is the cooking area where fresh pooris and other snacks are cooked. The menu changes from morning to evening. The day starts with poori and sabzi while the afternoons are filled with the regular servings of snacks like samosa, Moong Dal Ladoo etc. The eatery is more popular for breakfast dishes that includes Poori stuffed with dal pitthi, served with Aloo and Chhole ki sabzi and the highlight is the seasonal pickle you get with the poori sabzi plate. I was fortunate to try Lounji ka achar – sweet mango pickles with fennel seeds and Kachalu ka Achar. I loved the combination of sweet mango pickles and savoury Kachalu ka Achar. The preparation is completely prepared in Desi ghee. Although a winter speciality, I guess, this is the only place in Delhi where you can savour Dal ka Halwa round the year. The Ghee in the halwa was not overflowing and the sugar was just perfect. As I reached there in the afternoon, I got a chance to try fresh Samosas. The style of making samosas in Old Delhi is completely different from other parts of Delhi. The big-size pieces of potatoes are deep fried and then mixed with spices to be stuffed in the dough. At other places, it is mostly boiled potatoes- mashed up and mixed with spices. I quite like the fried version of potato stuffing. 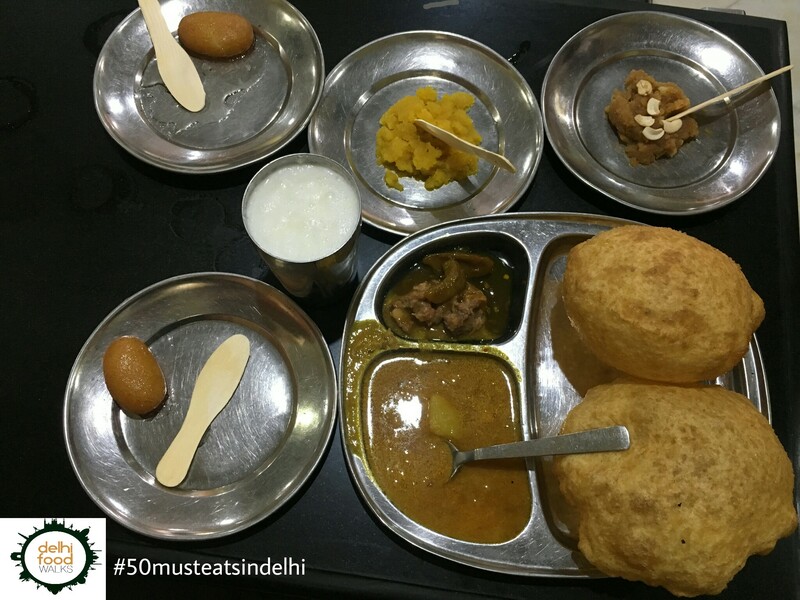 We rounded our food journey at Madan Lal Halwai with Moong Dal ka Halwa, Patisa, Gulabjamun and Lassi. All of the sweets were excellent. The square shaped pieces of burfi were big in size, quite uncommon at other sweet shops. Walking through the lanes of Sadar Bazar in the scorching heat, I was quite determined to find the extremely famous “Ashok and Ashok Meat Dhaba”. Once I did, it was nothing like I imagined it to be. Since it was extremely famous and had the word ‘Dhaba’ attached at the end, I thought of it to be a fairly medium-sized joint but it turned out to be just a very tiny hole-in-the-wall. But don’t get me wrong, I never judge a book by its cover and I’m glad I did not deviate from my policy this time as well. The food here makes up for the size of this shop and the story behind it makes it larger than life. This little shop was started way back in 1984 by two friends namely; Ashok and Ashok, well no surprises there! These two friends were titled as the “Macho gangsters” of this area. Alongside their rowdy business, they also loved to make and serve meat curry to the localities. What followed is history. They turned their passion of cooking into their profession and became proud owners of the Ashok and Ashok Dhaba. Ashok and Ashok are no more with us but their legacy continues. The shop is run by the younger generation. A medium sized dusty frame holds the picture of Ashok and Ashok smiling ear to ear, looking upon the shop still running successfully. The shop opens at 1 P.M and you’ll always find a crowd hovering for their meat delights. The Mutton Korma is made only on Wednesday and Saturday, and it finishes off in a matter of half an hour while the Chicken Korma and Biryani are prepared every day. The korma prepared here would definitely pass off with an A grade in a royal kitchen. Why I am saying this is because 30 different kinds of spices are added to the gravy and the entire thing is prepared with loads of desi ghee. The meat is tender and falls off the bones perfectly and the glistening golden gravy is full of aroma. It is so fragrant that your hands and tummy are provoked to eat it right away. The gravy is served with rotis (chapatti) interwoven with coriander leaves. This gravy is not your ordinary gravy. It is cooked with minced meat. The process is rather elaborate. A large tin of ghee is melted in a huge pan and then ginger, garlic and onions are added and stirred until golden brown. Next, the 30 secret spices are added to the mix and are left to ooze out their flavour and aroma. Mutton pieces and minced meat are finally added to this enticing mix and left to cook for 20-30 minutes. Later, the perfect amount of water is added and some chopped tomatoes are thrown in and it is further cooked for an hour and a half depending or till the gravy attains a smooth texture. The same procedure is followed to prepare the chicken curry. The biryani served here is very rich as well and is equally delicious. It was a matter of time when the clock struck 2:30 P.M. while we were still devouring the delights and the Ashok and Ashok Meat Dhaba was already out of their famous delicacies. Timings: 1 P.M. – 3 P.M. Location: 5820/42, Subhash Chowk, Sadar Thana Road, Near Sadar Bazaar, Chandni Chowk, New Delhi. 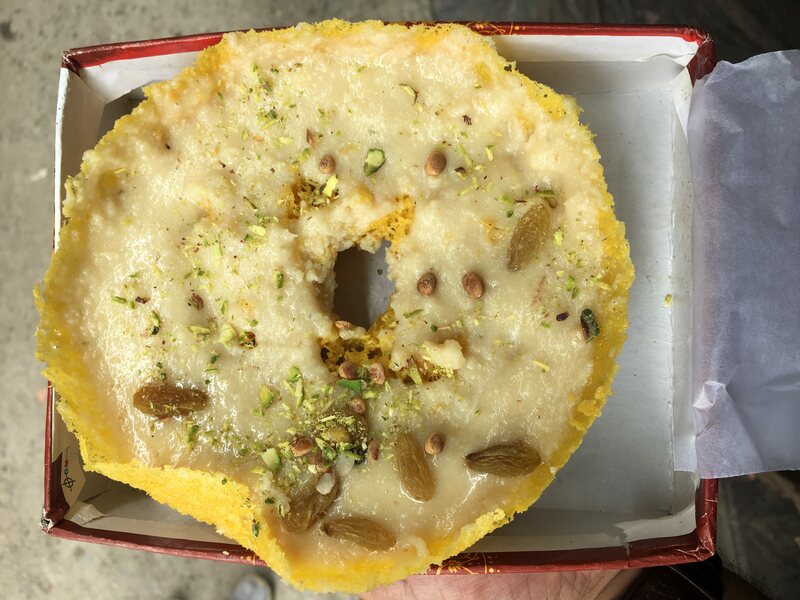 Delhi Food Walks provides a platform for food enthusiasts to share their culinary journey while keeping the rich and diverse culture of Delhi alive through specially curated food trails and food festivals. This year, Delhi Food Walks is organizing the first-ever Street Food Awards which aims to recognize various street food vendors present in the narrow alleys of Delhi and honour them for the delightful services. The winner will be decided from a pool of nominations across 20 categories and a few special mentions by our esteemed jury of food connoisseurs like Marryam H Reshii, Sourish Bhattarcharya and Rahul Verma. If you want your favourite street food outlets to win, do not forget to vote for them! Keep the child alive is what everyone has always said about growing up. 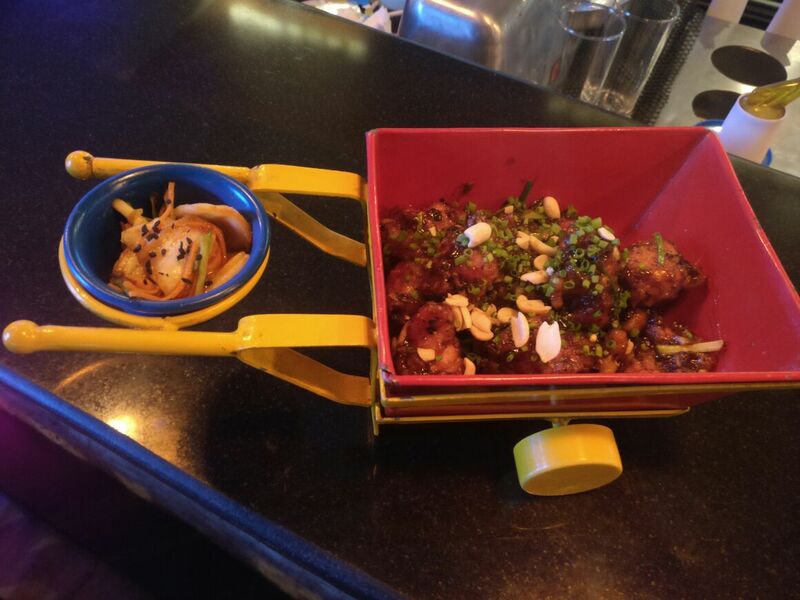 SportsDiner by HangOut is one of those places where you can be unabashedly childish. From Monopoly to Air hockey, it offers you everything; even if you fancy a round of bowling or a virtual reality game. Oh and I am not just looking at the 23 year olds who seek this opportunity to take a break from adulting but even you parents. While you grab a bite or a drink amidst snooker tables, your little ones can easily be mesmerized by the interactive play area on the next floor (the pizza parlour and the hospital areas are cute enough to start playing yourself). Next came the Kung Pao chicken with what we figured was a pickled cabbage that was not kimchi. Delhi is almost infamous for its chin-jabi culture and if your hangout doesn’t serve you good masala chinese, why is it even a hangout. No such situation here. The chicken was as juicy as much as it was exploding with all the garlic and chilli peppers. 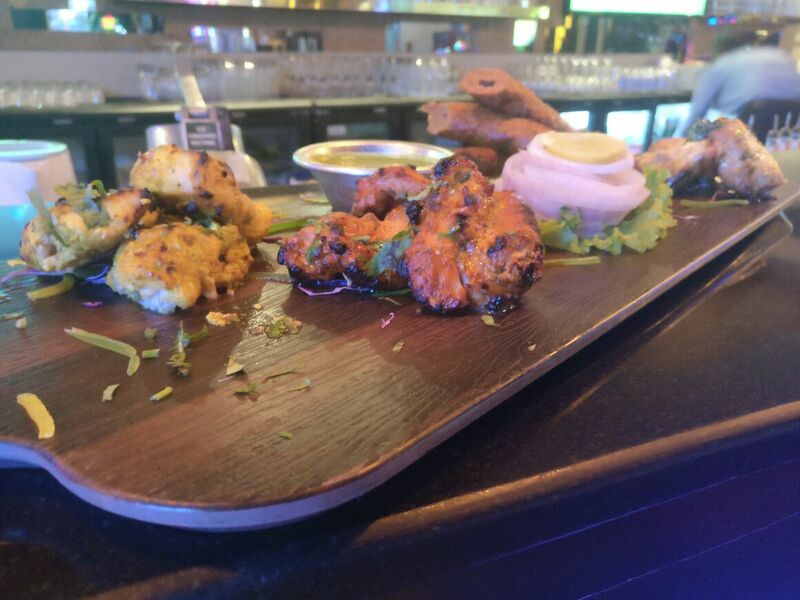 The special non veg platter comes with 4 different types of tikkas. This is the part that leaves you with a sense of dissatisfaction. The classic chicken tikka was still cooked well but the fish and malai tikkas had perhaps had too much time in the tandoor and ended up dry while the seekh was bland and chewy. But hey, the best part is the hospitality of the place. The diner has the sweetest staff, who will readily take on any criticism their way and work on it (it’s such a rarity nowadays that I always like to mention it). They are also very keen on making the entire experience better and will keep accommodating all your requests. It’s the one corner in the heart of the poshest areas where you can let loose. It started with a query on the Delhi Food Walks Facebook page and Instagram – “Where do you get the best ghewar in Delhi?” Most of the respondents answered unanimously Chaina Ram in Fatehpuri chowk as the best ghewar. The second most popular recommendation, however piqued our interest with the answer being Sonepat. After a brief interaction with ghewar lovers on social media listing out all the known places in Sonepat for Ghewar, I headed on a ghewar trail last Sunday from Delhi to Sonepat. A good friend of mine, Naman helped me in exploring the places in Sonepat. Ghewar is a traditional monsoon sweet dish, popular in Rajasthan, Delhi, Haryana, Gujarat, Madhya Pradesh. The basic ingredients are all purpose flour, sugar, milk and ghee. First you will need to make a thin smooth batter using refined flour and milk. Next you slowly pour the batter into a ‘kadhai’ or a wok of boiling ghee or Vanaspati, all the while separating the fried batter to the side of the cooking utensil. Once fried, it is dipped in sugar syrup or it can simply be poured on top and drained with the help of a wire mesh. There are different varieties of ghewar- kesar ghewar ( flavoured with saffron ), milk ghewar ( the batter is made using milk ), malai or mawa ghewar ( a layer of mawa/rabri is added over the top of the ghewar and garnished with dry fruits ) white ghewar ( simple ghewar – the batter is made with water with no milk in it). The sizes and shapes also vary– some of them are heart shaped while other could be round or squared; simply achieved by using different moulds and the sizes could vary from small to the huge ‘fit for a king’ kind. The Ghewar trail in Sonepat started with Shaant sweets corner. The shop is located inside a lane on Geeta Bhawan chowk. I tried a medium sized Kesar- Mawa Ghewar garnished with raisins, pistachios and chironji. This one was a mouthful of sugar, sugar and sugar. The ‘mithas’ or sweetness was literally dripping out of the ghewar. Next I moved to the Sonepat bus stand where a number of ghewar shops are lined next to each other. Some of the shops were selling jeans and ghewar at the same place. Such is the popularity of Ghewar in Sonepat. Most of the shops have enormous ghewars there. The rooftops were like ghewar factories producing ghewars by the kilos (probably tonnes). The whole place was working in an assembly line like production- On one corner, a man was pouring the batter of ghewar in a big khadai filled with boiling ghee. The next in line was dipping the ghewar in sugar syrup- ready to be sold to customers. I tried a small bite from the king size ghewar. It was again too sweet to me. The quality and price is less compared to other ghewar shops keeping in mind the moving customer from different district and the shops close proximity to bus stand. We stopped midway at Triloki halwai. Here the barfi is what caught my fancy instead of the ghewar we were really out to taste, but hey Sonepat is a hub for mithai. 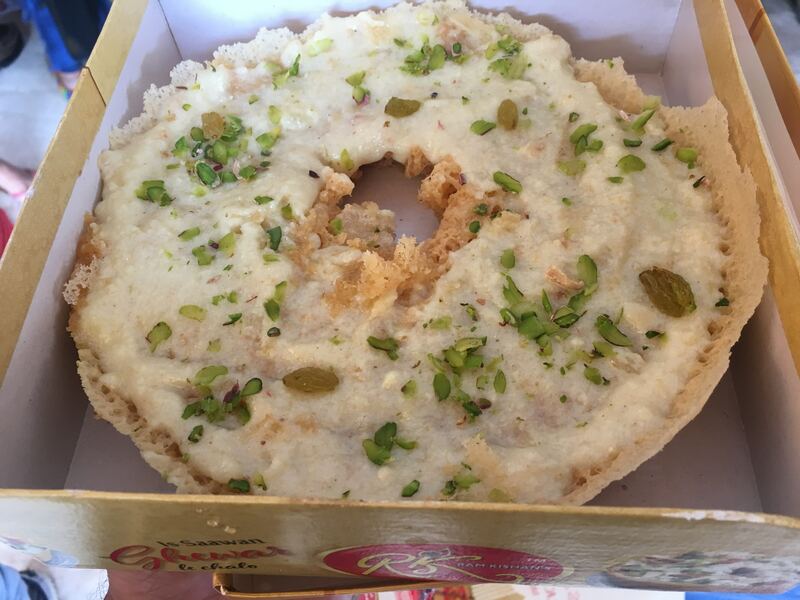 Next, we went to the one shop recommended by everyone – R K Sweets in Subhash Chowk. The shop started with selling pakodas but have now diversified into Ghewar. Although they still have a pakodas stall outside the main shop but R K sweets has now become synonymous with ghewar in Sonepat. To compare the taste, we sticked to malai ghewar here as well. It tasted heavenly- not too syrupy plus the quality of the batter and the consistency was really good and again the same toppings except chironji. We thought that our search for the best Ghewar in Sonipat ended with this but we had picked one more place; Sunder mishtan bhandar in bara bazar. Tucked in the busy lane of Sonipat, the place is known for its quality sweets. 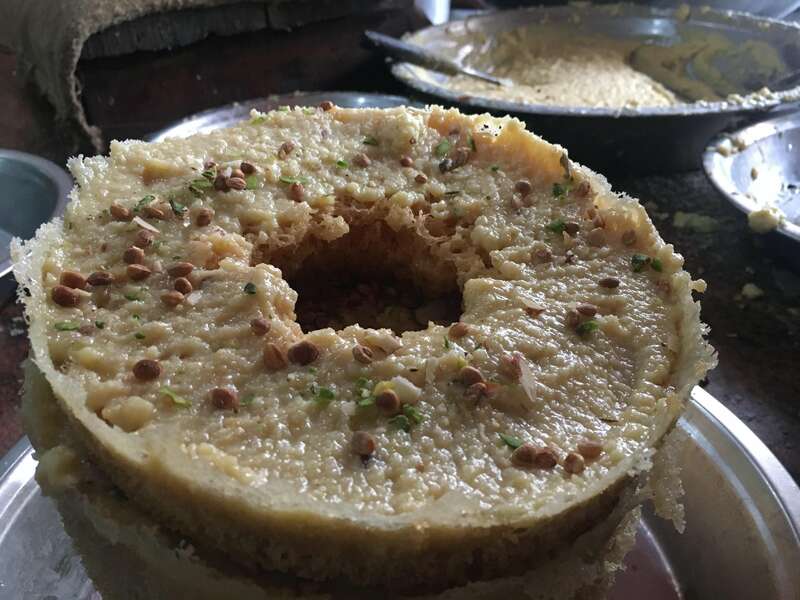 At the entrance, one man is seen frying the ghewar, while another is adding the sugar syrup and mawa over it and then finally sprinking a generous helping of dry fruits – mainly chironji, almonds and pistachios. This was the best ghewar I had in Sonepat- one, it was fresh. Two, it was not too sweet, the sugar was completely drained out of it. Three, it was crisp and soft at the same time-that shows that it was fried just perfectly. Four, the quality of mawa was excellent, slightly grainy – adding a nice texture to the ghewar. Five, the almonds, chironji and pistachios were a better quality than the previous shops. After a day of doing what I love best and stuffed to the throat, I returned home happily, finally; carrying loads of Ghewar with the belief that Sonepat should be hailed as a Ghewar district of Haryana. Etymologists trace the origin of the word “chocolate” to the Aztec word “xocoatl,” which referred to a bitter drink brewed from cacao beans. The Latin name for the cacao tree,Theobrama cacao, means ‘food of the gods’. 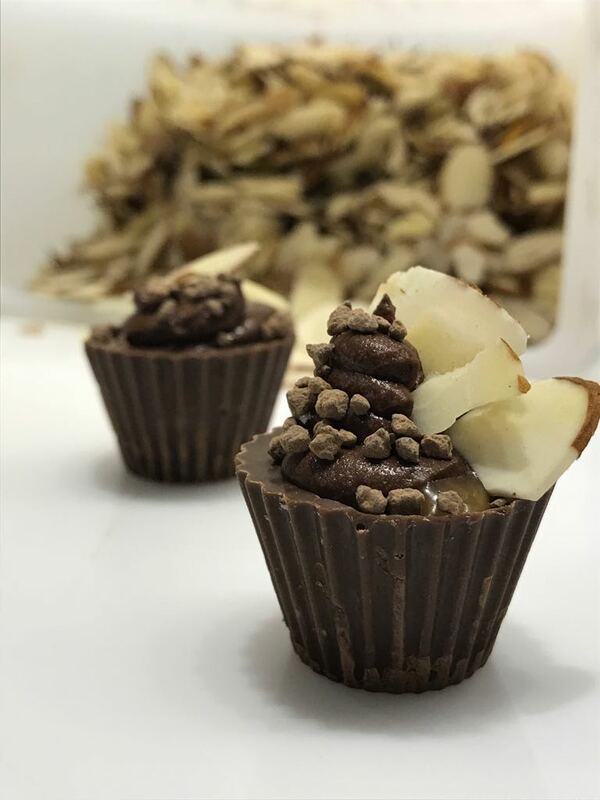 Throughout history, there have been several accounts of the foreigners in India growing greedy over this one bittersweet thing called ‘chocolate’ (especially the Spaniards). Ask any modern Indian today and you will find someone preferring one variant over the other but no one ever refuses a chocolate and then there are people like me. Food lovers who go to great lengths so that we can understand and put the best into our mouths and more so to be able to tell you where you can find your money’s worth. ITC’s luxury chocolate boutique ‘Fabelle’ has taken luxury to another level with its couverture chocolates. Now it is offering you a chance to take it to another step. Their new campaign lets you choose exactly what flavours you want in your chocolate. If you like the dark or the milk ones, with caramel or with chillies or maybe you want to surprise your taste buds with a little sea salt, they do it all. And then they let you name you sweet little chocolate cup after yourself.